Following World War I another new V was introduced. It was basically the same shape as today's V, minus the serifs at the top. The design was worn throughout the 1919-1923 period, with two exceptions noted below. A number of players during this era wore a V which was not the same as the official version. This was due to the poor production techniques of the period with the material being cut, positioned and sewn by hand which resulted in a number of such oddities. While Victoria's 'A' team was away at the Perth National Carnival, Victoria's 'B' team played two matches against their South Australian equivalent, known as the South Australia 2nd XVIII. The V worn on this Victorian team's jumper was noticeably smaller than that on the other State jumpers during this period. Introduced for the 1924 National Carnival played in Hobart. The circular neck changed to a button-up v-neck with a collar, the shorts moved to just above the knee, and the V was similar to the non-standard issue that was worn 1919-1923. The 1927 National Carnival was held in Melbourne and, in a design change possibly inspired by the eternal enemy of football fans at the MCG, a new seagull-like V was added to the front of the jumper. The "seagull" took flight one last time, flying to the Adelaide Oval for a thrilling draw played in front of 36,000 spectators. A new, tighter V was introduced with angled top edges. This design was worn for the two interstate matches at the MCG played in July and August of 1928. 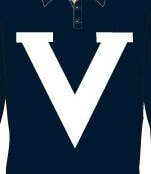 The design introduced during the second half of the 1928 interstate series served as the sole jumper worn by Victoria throughout 1929. 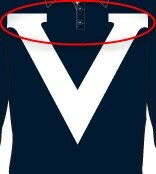 At the Adelaide carnival the V was noticeably smaller and higher on the jumper than before. This was also the only time in Victoria's history they wore black numbers on a number panel instead of their usual white numbers sewn directly to the back of the jumper. This game was one of only a handful post-1905 in which the Victorian team wore coloured shorts instead of their traditional white shorts. The first use of serifs since the 1908 National Carnival jumper. The bottom of the V became horizontal with a distinctive, flared base. Additionally, the numbers returned to white and the shorts became smaller. First sighting of the modern V, although it was oversized compared to today's version and the bottom edges of the serifs were rounded and different heights, instead of straight and equal (see below). Another new V was introduced; a larger version of the V worn at the 1930 National Carnival. Matching uniforms - for this match the VFA and VFL wore an identical V, with their respective colours the only variation between the two sides. This remains the only time in top-level interstate/representative football when both teams wore matching designs. Black shorts - this game was one of only a handful post-1905 in which the Victorian team wore coloured shorts instead of their traditional white version. Since 1909 the VFA's official uniform featured white shorts, but in 1931 they had made an exception and wore black for their historic clash against the VFL. However, for this return match in 1932 the VFA requested the league switch to coloured shorts and the VFL reluctantly agreed. Note - when these teams met again in 1934 the league had returned to white shorts for all matches, regardless of the opponent; forcing the VFA to wear their non-traditional black shorts in future contests between the two sides. A return to the V first worn in August, 1931. Victoria reverted back to the uniform of June 6 for their trip to Adelaide Oval, worn with their traditional white shorts. A return to the semi-modern V of August 1931 resulted in the Victorian uniform surviving a season unchanged for the first time since 1930. Note that during this period a handful of players in team photos are wearing other designs from the 1930-1932 seasons. The Great Depression was in full effect when these matches were played so it's logical to assume that players did not receive a new jumper unless making their Victorian debut or, in the case of veterans, they requested one. Stretched, thinner version of the V for this match at Adelaide Oval. The design was unique but did not last beyond the season. After a brief flirtation with a new design in 1936, the Victorians returned to the semi-modern V worn in the vast majority of matches between 1931 and 1936. This uniform was worn until the end of 1941 when the Second World War brought an end to interstate football for three seasons. From 1908 onward Western Australia's official uniform featured white shorts but since the 1927 National Carnival they had adopted a policy of always wearing black shorts against Victoria. However, for this match in July 1938 at the MCG the Western Australians wore white, resulting in the Victorians breaking with tradition and switching to black. No official reason for the swap has been found but it was likely due to the Western Australian team embarking on their Eastern States tour with only one set of shorts, leaving behind their black shorts which were only required for this game against Victoria.